Official student clothing of the IKMF and IKMF Australia. We are authorised by IKMF Australia to re-sell these original and authentic items through our online store. All products are of the highest quality dry-fit, cotton, cotton/lycra, or microfibre materials. Shirts are officially authorised IKMF - Australia student shirts, and all pants/shorts are sourced directly from IKMF HQ in Israel. Products may be picked up during one of our regular training sessions at KMTA - HQ, or one of our suburban locations with prior arrangement. Shipping is done through Australia Post and is calculated during check-out. IMPORTANT NOTE - We do not sell or ship these products internationally. All requests for international orders should be directed to the Local IKMF Branch and Director in your country. 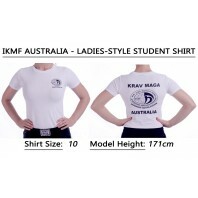 Official IKMF Australia White, quick-dry unisex Kids student shirt (Image is of the same unisex shi..
Official IKMF Australia White, quick-dry unisex student shirt NOTE: New updated IKMF Australia Lo..
Official IKMF Australia White, cotton-lycra capped sleeves Ladies style student shirt NOTE: New u..